Here we go again. Third time lucky. 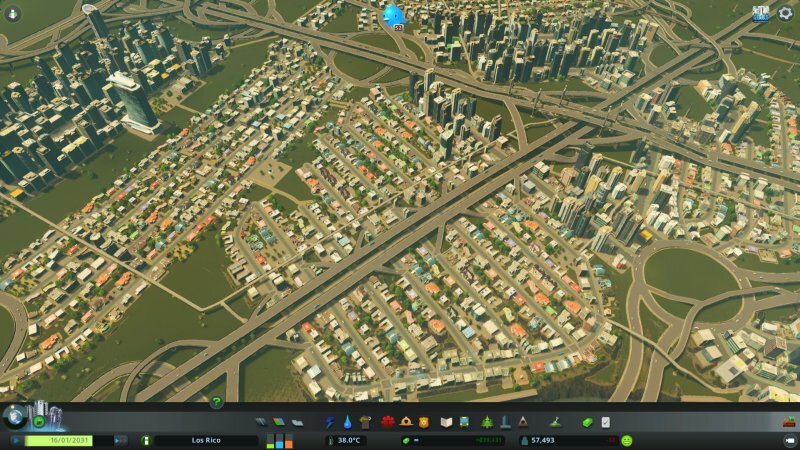 I've already gently bored you with half a dozen articles on Cities Skylines traffic management, offering ideas and solutions to make the game's engine and somewhat incomplete pathfinding algorithms work with you, rather than against you. 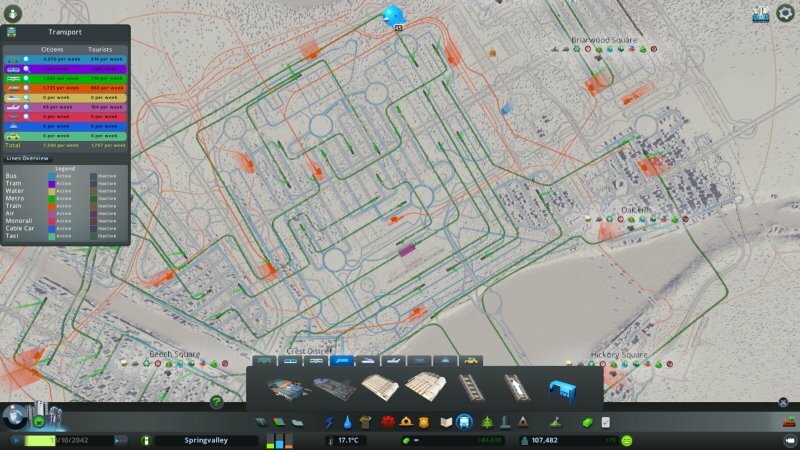 After all, urban simulation is meant to be fun! All my previous guides so far had one problem - they were expensive. 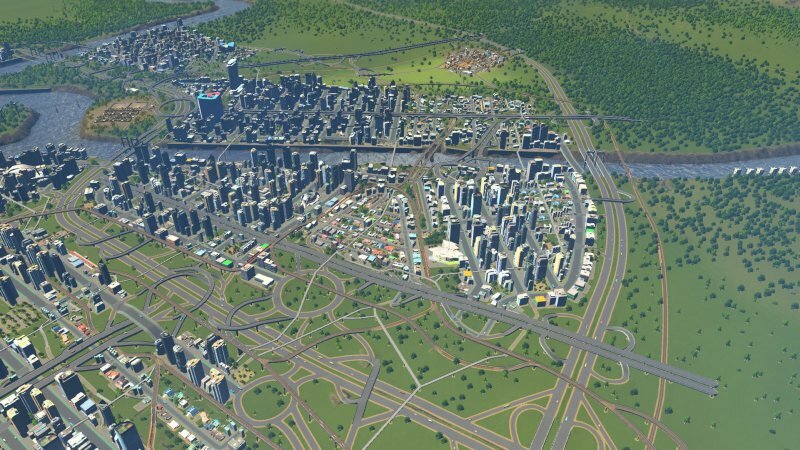 The recent ones focused more on making the monetary side of things tick, too, but proposed infrastructure still came with a hefty bill, making my cities less profitable. So I got me thinking. Can I be cheap - but also make kickass 100K+ cities with high demand, stunning layout and efficient roads? The answer is, yes. So the mission is, be in the green. Make sure you earn more money than you spend. With the infinite funds mod, it's easy to work around this, but still. 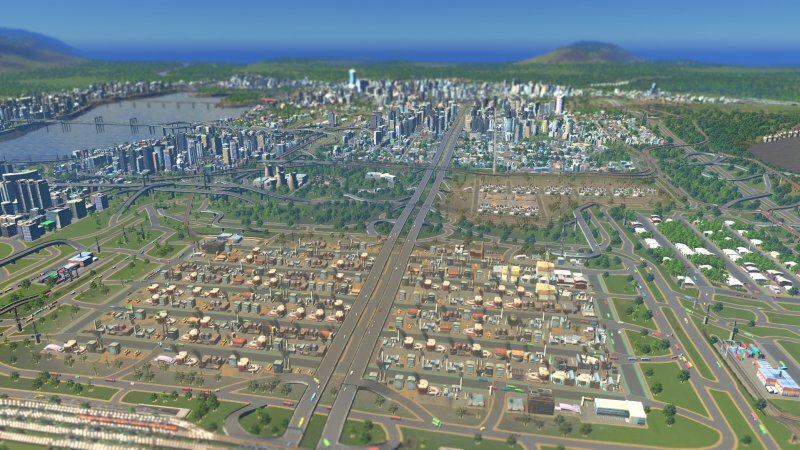 Overall, I think being profitable in Cities Skylines is easier than it was in SimCity4, for instance. So what we want to do is cut down on all the unnecessary costs. If you can get away with one of something rather than two, build just one. Fewer services. Smaller roads. Fewer stations. More efficient services. Smart network grid planning. Let me show you how. The old layout and planning works just fine - and yet, we can do better. 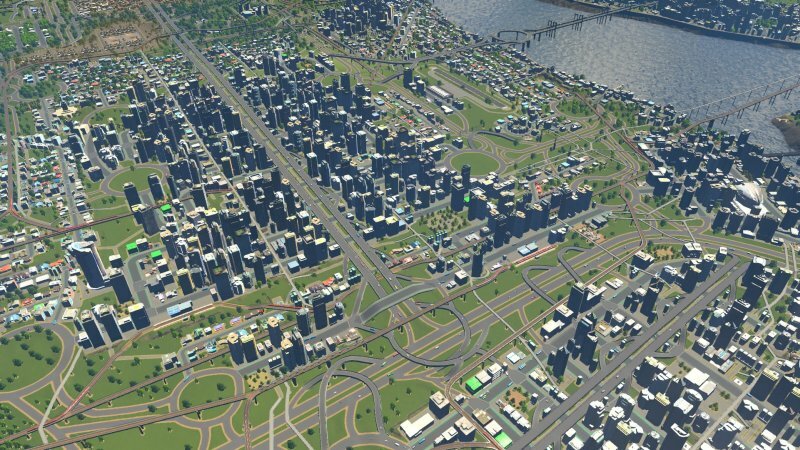 Cities Skylines has two built-in policies that allow you to try to rein in the chaos. You can block heavy traffic from entering "smaller" roads, and you can use the Old Town policy to completely ban trucks from your residential areas. The former applies to two- and four-lane roads, which means you can still have trucks thundering through your neighborhoods. This means clogged junctions and roundabouts, as the vehicles will always cut a short one to their destination, not necessarily the fast one. The latter will prevent trucks from going anywhere you have green plots - supply vans will still be able to reach your businesses. 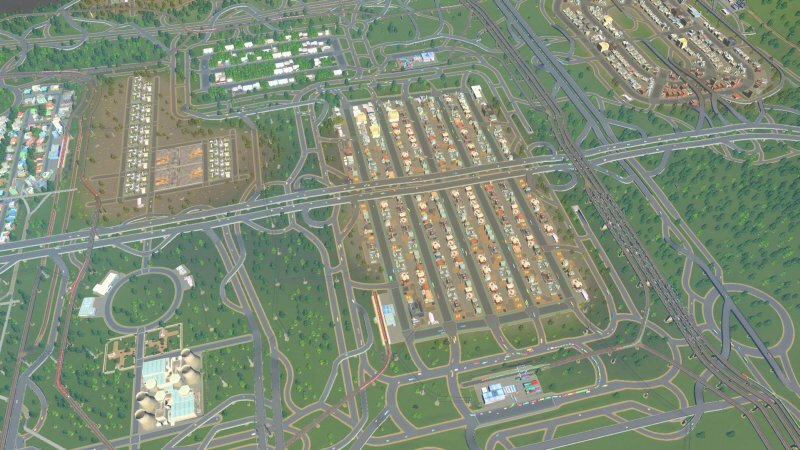 Most of the "old layout" complexity stems from having the heavy industry and city traffic mix. My guide today relies on the first policy being in effect. Making sure your trucks do not drive off highways into residential areas to save 25px worth of road. As for the previous models we used - internal + external train loops, well now, we will try something else. I decided to focus on making my cities as profitable as possible. I love underground passages, but they are very expensive. Then, subways, trams and such make for lovely decor, but they also incur a cost that is disproportionately high for the volumes of traffic they ferry. In other words, they can never turn profit. My motto for the experiment was - no inefficient, money-losing services. 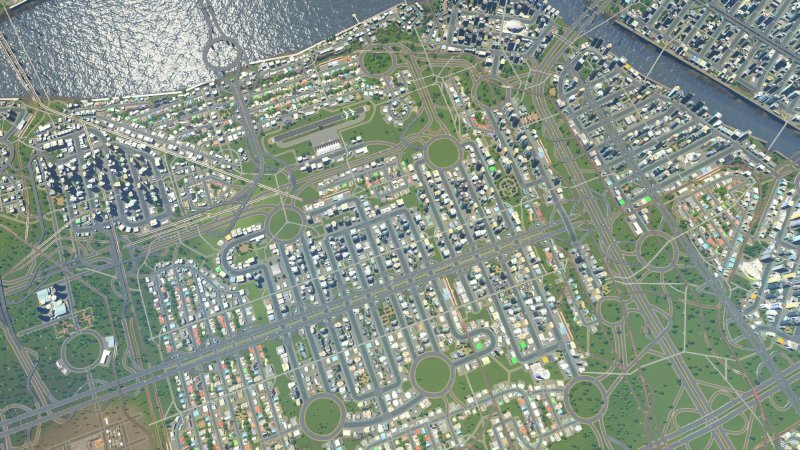 First, I decided to build high-density grids with six-lane roads and adjacent bike paths as well as two-lane + bike low-density districts. Standard roundabouts connect different neighborhoods, while two-lane elevated highways cross each neighborhood at roughly its middlepoint, with on and off ramps to the city streets. This means that pretty much any car, and more importantly, any van, has to travel equal distance to get onto a highway that will channel it toward outside connections, or back to the industry zones. It's not only making money, it also looks right. 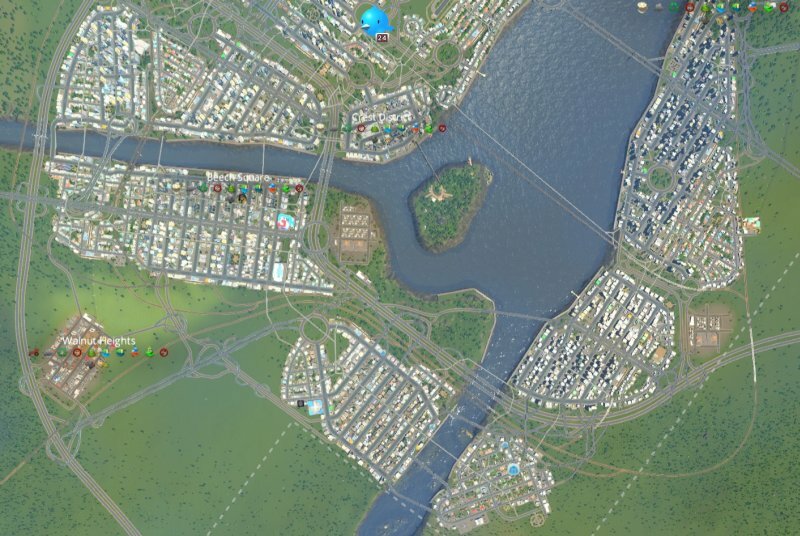 Bike lanes also reduce traffic, and I made sure to use them to connect remote districts, often crossing highways and rail connections. The same applies to footpaths, as they can carry and unlimited volumes of pedestrians to great distances. Much like two-lane highways, I'd always have at least one, often two and sometimes three elevated footpaths crossing each neighborhood and connecting to adjacent zones. 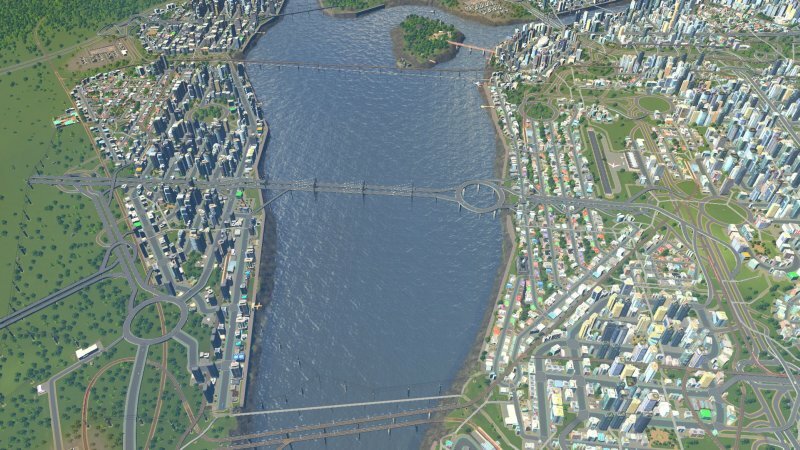 Elevated highways crossing districts, loop roads for the industry. Transport services are limited to buses - and plenty of them - some subways - for medium-range distances from one district to another, or to connect large zones, running perpendicular or diagonal to the road grid - and finally, trains. Only what arrangement, you may ask. What do I know about trains? I decided to stick to the one connection = one station rule. 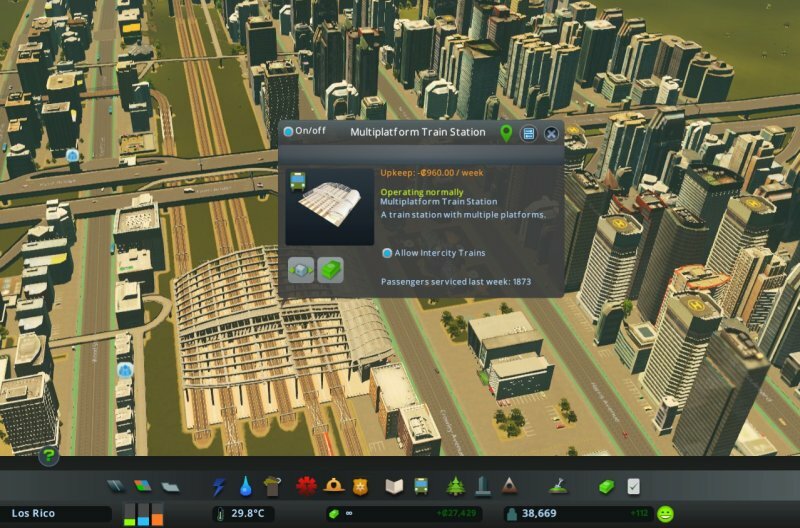 This means my cities would allow inter-city passenger traffic only to one or two major stations, later also upgraded to 12-track hubs that make for an even cheaper and efficient solution, and also only one cargo station per outside connection. Like I said, no other modes of transport, as they are a waste of money. Notice the layout - grids + roundabouts; highways to reduce pressure on ingress and egress points; Long foot paths crossing entire neighborhoods and running into adjacent ones; bikes lanes; train traffic loops around the city and then dives "deep" where needed. This does require building smart industrial zones, though. Now that all of your trucks will be converging into just one or two central stations, you need long approach roads - they don't need to be wide, one-way two-lane road is sufficient, the rest is just a waste of space and cost - and you need to place the stations so they are more or less equidistant from your different districts - oil, ore, forest, agriculture. The one cargo station serving the entire industry area is very busy; but it works and there's no shortage of raw materials or goods. I struggled a little in the beginning, but then I figured out how to do this in an elegant manner. 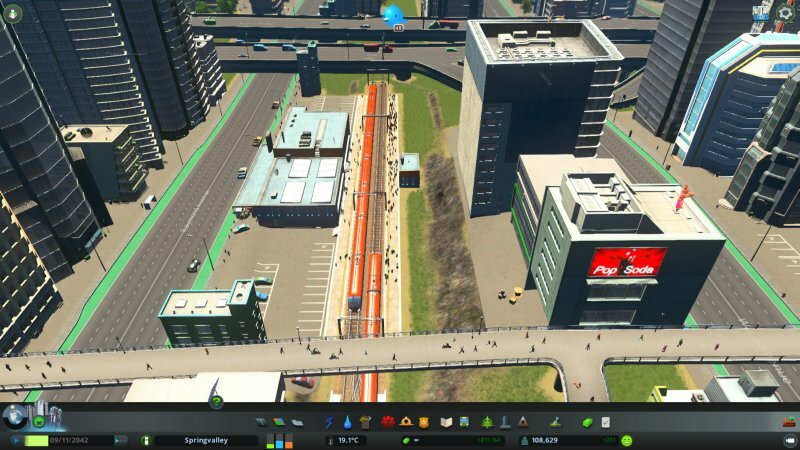 You will never probably fully solve the red traffic phenomenon: the stations can only accept that much traffic at a time, so you will have queues. But the traffic will still be flowing, and you will have a steady supply of goods, which is what you need to make people happy and your cities grow. The passenger side of things is easier. Essentially, you send people to distant neighborhoods by train, and then allow tourists and foreign workers into one or two stations. You don't need much more than that. Just make sure you have other, adjacent inner-city train stations that can transfer people around. Lots of happy people right there. Bus routes are also circular and relatively short, mostly covering in-district traffic, with an odd line connecting to the nearby zones, helping ferry some of the people around - those not using foot or bike paths or subways. Keeps the costs down, and the bus traffic comes in rather profitable. Although the overall income is low compared to what you can generate from taxes, every little bit helps. This is far more pronounced with subways and trains, where each station costs almost 1,000 dollars/week upkeep, so the fewer of these you have the better, and if you place them smartly, you will still maintain good demand. The end result is net profit that ranges anywhere between 35% and 80% relative to the population, i.e. a 100K city could be making as much as 80K money per time period (week or month or whatever). After a few successful rounds and flourishing cities with good demand and excellent income, I decided to optimize this formula even more. Industrial areas absolutely do not need anything more than two-lane roads in the best case. A single passenger station transports all the workers into the industry area, and from there buses ferry people to their workplace. There are separate bus lines circling the district, each one on its own, and connect to the shuttles that run to the passenger station. Some red here and there, mostly around cargo stations, but overall, it flows great. It seems better to have many small industry areas than one large one, as the traffic is more distributed. 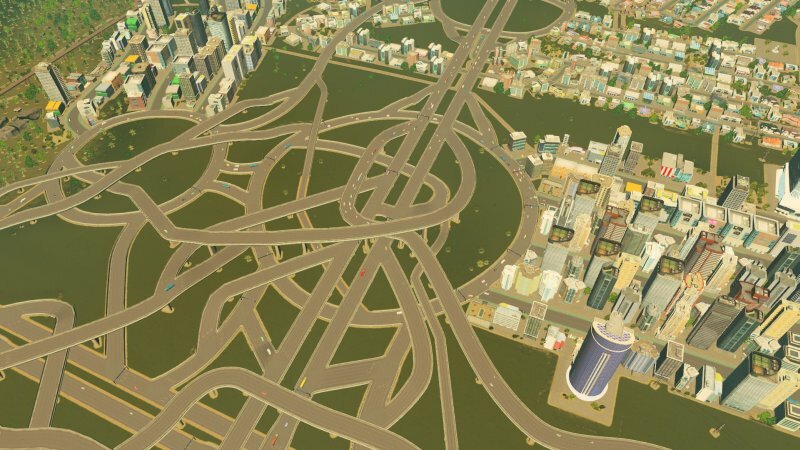 You then connect each one to a highway - these can be two-way highways plus two-lane highways, and you don't need fancy stuff. Just a plenty of easy and relatively short connections to simplify the pathfinding mission. I also decided to trim down on the track traffic - I use a single 12-track hub for outside traffic plus the internal loop, with fewer but more strategically placed stations. The same applies to subway - fewer stations that carry people over longer distances and to central areas. The bus then takes care of the rest. There's no point having subways running to industry zones, or short subway routes within the same district. That's just not profitable, as it gives you only a somewhat improved people distribution. My frugality crusade extends to all other services - schools, medical facilities, etc. It is possible to build fewer of them. Not garbage collection, though. That's the one you must keep tip top. So build them incinerators like mad. 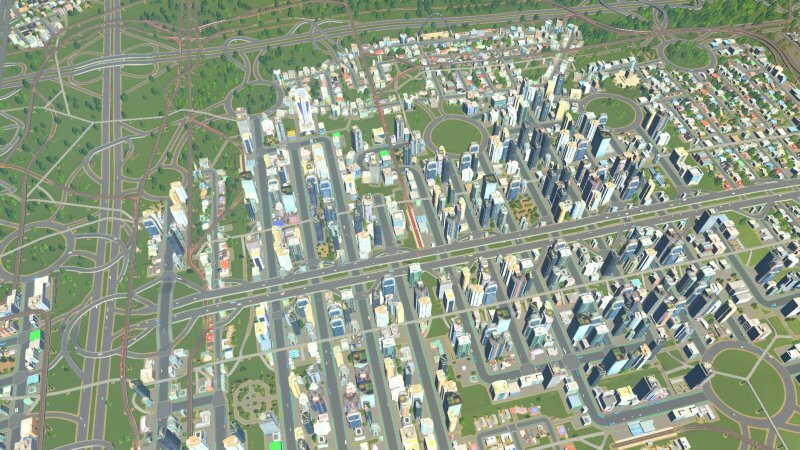 Other than that, the cities are fairly tolerant, as long as you have enough parks, and you keep the traffic flowing so there's constant supply of goods. The rest really becomes optional, and it's up to you. But you don't need much to hit the highest level of housing development. The important thing is that you people can travel freely around the city. If in doubt, build more bike and foot paths. They are cheap, but the benefits are immediate. After that, it becomes a quest - no longer a crusade. 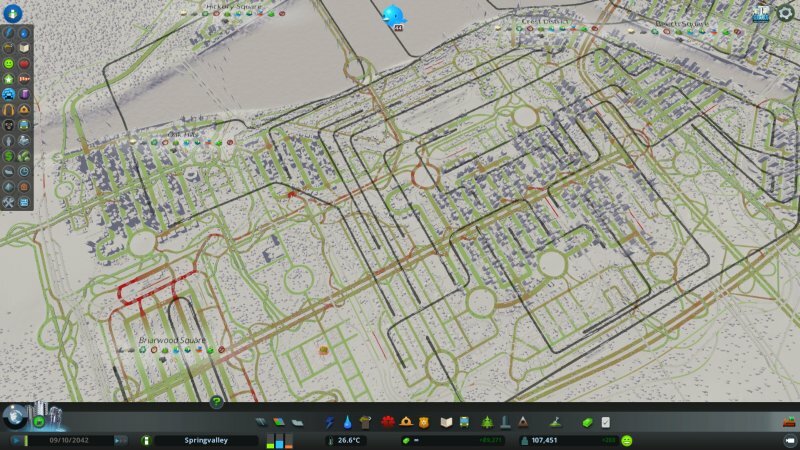 You focus on making nice, organic, ever so slightly chaotic cities. 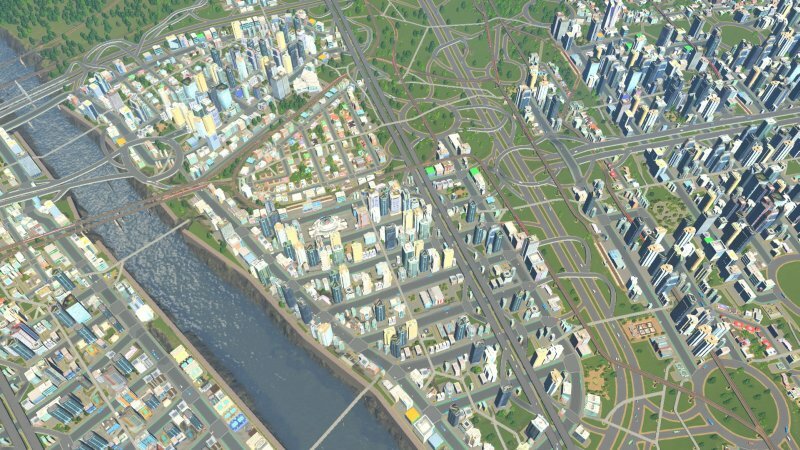 Perfect grids do not and should not exist. There must be some asymmetry creep, and no matter how well you plan, there should be an element of mess and unpredictability in your architecture. I find that the best part of my newfound wisdom and money-saving measures. I will not claim to be a prophet of city building. Not by a long shot. But I do think my methods offer a good balance between fanatic OCD-drenched city planning and fun. The idea is to see your city grow without feeling like it's slipping away from you. Nor should you constantly fret and fuss over the funds. Somewhere in the middle, in the sweet spot of creativity and leisure. After all, it's just a game. An addictive one, but still only a game. 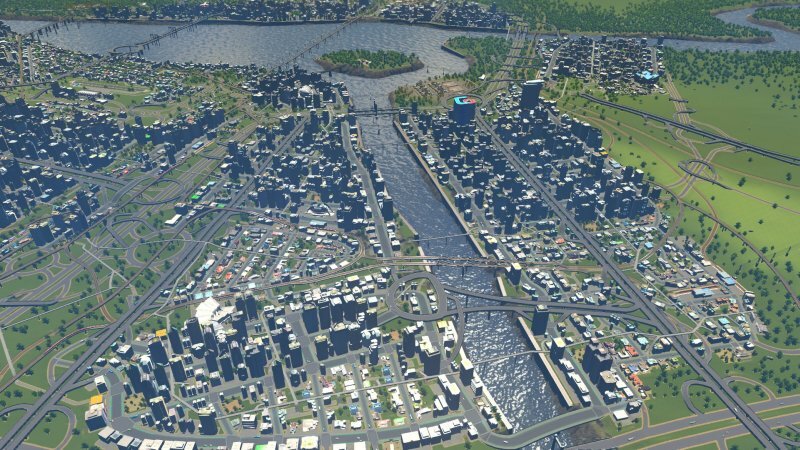 Cities Skylines is a tricky one, but it does not aim to destroy you. Far from it. Be nice, don't overspend, and focus on keeping industry away from living zones, and you should be fine. Now, I have read a lot of similar guides online, and everyone seems to have their own private bible on how things should be done. I'm interested to hear if you have any mindblowing ideas of your own. Share them. That'd be all.